The early history of Bethel Church, and the people who went into the constitution of it, is mostly about the family of one man, Jeremiah Jeffrey, who never reached Texas, but died enroute. In the year of 1819, a church was constituted in the home of Jeremiah Jeffrey, 8 or 9 miles northwest of the town of Tuscaloosa, Alabama. They named this church, Bethel. John Fleming and wife were charter members of this church and later were charter members of this Bethel Church at McMahan. Elder Thomas Baines was one of the Elders in the constitution of The Bethel Church in Alabama. He was the great grand- father of the late Pres. Lyndon Baines Johnson. Richard Cole, who married the daughter of Jeremiah Jeffrey, joined Bethel Church in Alabama and was baptized by Elder Thomas Baines. He and his wife were charter members of this Bethel Church. Bethel Church at McMahan, Tx., was constituted on Sat. June 19, 1852… Those of that faith and order, at that time were called Predestinarian Baptist. 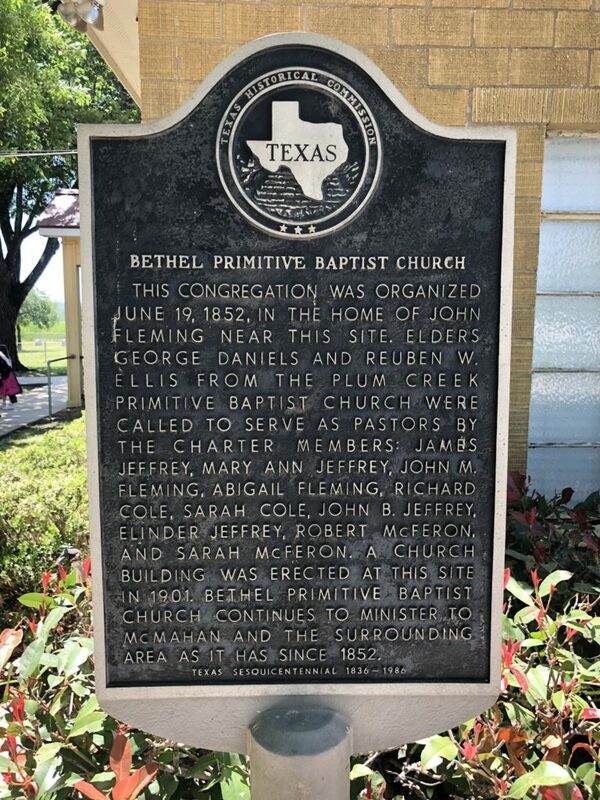 Elder George Daniels and Elder R. W. Ellis, from Plum Creek Church, were the ordained Elders composing The Presbytery that consti- tuted Bethel Church. On Sat. before the 3rd Sunday in July, 1852, The Church chose Elders George Daniels and R. W. Ellis to serve jointly as Pastors. Other Elders to serve The Church as Pastors have been: J. M. Baker; W. S. Smith; Abel Baker; J. W. Shook; J. W. Baker; A. A. Culpepper; Richard Cole III; J. S. Newman; G. W. Cox; M. T. Baker; W. F. Baker; E. P. McNeil; Armo Paine; W. H. Richards; E. L. Griffin; S. A. Nite; James Henthron; then W. R. Daniels, Jr, and Hulan Bass, since Sept. 1988, till Feb. 2007. Elder Sonny Huckaby since Feb. 2007 till now. During the past 142 years, The Bethel Church has ordained ten ministers, namely: Elders Abel Baker; J. W. Shook; J. W. Baker; G. W. White; A. A. Culpepper; Richard Cole III; G. W. Cox; M. T. Baker; J. G. Fowler; W. R. Daniels, Jr; and Mark Richards. The first member to join Bethel Church on an experience of Grace and Baptism was George W. Cole, in 1857. During the past 148 years, Bethel Church has had 8 different places of worship. In 1852, it was constituted in the home of John M. Fleming, some 500 yards south of the present location. The 2nd Church House was on the George Tucker place, now owned by D. T. Thomas, about 1 1/2 miles south of the present Church location. It burned down and another house (the 3rd) was built on the same site. The 4th House was built on the Oliver Bishop place, now known as the Foster White place, presently owned by Jesse Williams. In 1889, the “Association Issue” was agitated to the division of The Church. “Upper Bethel” built a house on the Med Jeffry place, north of McMahan – about 2 1/2 miles. “Lower Bethel” built a house east of McMahan, about 1 mile beyond the Walter Long place. In 1901, after both factions had been reunited, they built a wooden building on the present site. In 1952, the wooden building was moved and converted into a lunch room, and the present tile building was built. Bethel Church was constituted on Sat. before the 3rd Sunday in June, 1852, and has had a meeting on that Sat. and Sunday from then until now. At one time, there were three factions of Primitive Baptists using the same house, and the 3rd Sunday has always been one of the Sundays used, with the Sat. before. During these 124 years, the World has undergone many changes, with many new ideas and lots of man’s inventions; yet The Bethel Church still stands for the same Bible Principles on which The Church was constituted by our forefathers. This Church, like others, has had her share of troubles and trials, but the Good Lord has seen fit to bless her with faithful men and women to stand by and defend her. The Cemetery that sets beside The Bethel Church was started in 1847, with the burial of a young Ellison girl, a descendant of the Jeffrey family. The land was given by John M. Fleming for a Cemetery. Five of the charter members of Bethel Church, we know for sure, are buried in this Cemetery, together with Elder R. W. Ellis, the minister in the constitution. There are 11 Primitive Baptist ministers buried there, namely: Elders Elders Abel Baker; J. W. Baker; M. T. Baker; C. P. Galloway; R. W. Ellis; G. W. White; Richard Cole III; W. Y. Haire; J. G. Fowler; Jesse Bass and S. N. Nite. along with many Deacons and Church Members. The State of Texas has erected an “Historical Marker” at The Bethel Primitive Baptist Church, in 1987. © 2019 Bethel Primitive Baptist Church All Rights Reserved.